Heading into a season with a lot of uncertainty at numerous positions for the Chicago Cubs, first base is one of few sports that they solidified starter that will be there for the entire season in Anthony Rizzo. After signing a seven-year contract extension with the Cubs in May of last season, Rizzo had disappointed at the plate for the rest of the season. He finished the season with a .233 average and a .323 on-base percentage. But the worst part of Rizzo’s struggles in 2013 was his lack of run production, batting just .191 with runners in scoring position. Rizzo could have been close to 100 RBIs but his lack of clutch hitting held him to 80. However, it wasn’t all bad for Rizzo. He did hit for some power with 23 home runs and a total of 65 extra base hits. And if you continue to look deeper in to some batting metrics, Rizzo had a very unlucky BABIP, which represents a batters average on balls hit in play. He was well below the league average for first basemen in this statistic. Look for a bounce back year for Rizzo at the plate. Anthony Rizzo stretches over Cardinals dugout to make spectacular catch. One of many gold glove caliber plays made by Rizzo in 2013. 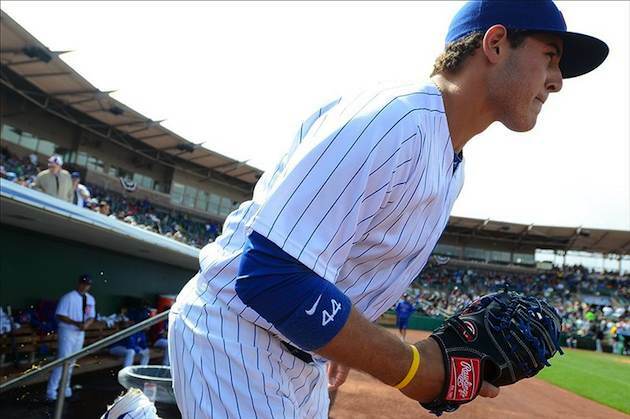 Despite offensive struggles, Rizzo was a very durable player for the Cubs as he played in 160 games in 2013. He was also a gold glove candidate and probably should have won the award with just five errors on the year. The Cubs know the have a guy that will play everyday and play great defense but they will need to see some more production at the plate from Rizzo if they hope to win some ball games in 2014. The Cubs have the luxury of not having the worry about a backup first baseman on the major league roster but the do another above average prospect at the position in the minors. According to rankings on MLB.com , the Cubs have the fourth best first base prospect in Dan Vogelbach. Vogelbach had his first full year of professional ball last year with the Kane Country Cougars. He had a very good season at the plate batting .284 with 17 home runs and 21 doubles. Vogelbach has a very good approach at the plate and does not strike out very much. In the field, Vogelbach has been limited to just first base and some scouts viewed him as a future designated hitter due to his weight. However, he showed up the spring training this year having lost 3o pounds and looking to become a better fielder. Vogelbach does have the potential to be an everyday starter in the majors but it probably will not be with the Cubs. If he continues to play at a high level in each level of the minors, Vogelbach could be a nice trade piece for the Cubs in a year or two.